Growing upright with arching branches, the Tuscarora Crape Myrtle is a mildew resistant crape myrtle developed by the US National Arboretum. This coral bloomer is part of the group named after Native American tribes. Your yard will come alive from mid summer to fall with large crepe-like coral pink blooms only to change foliage from dark green to fall's orange-red. Beautiful tan bark exfoliates as it ages making for excellent winter interest. As a point of reference, in the South the Tuscarora Crape Myrtle is a small growing tree in the 15 foot height (and equal spread). But, in the St. Louis area winters can often cause winter injury to these trees and they are often seen as more as lower growing shrubs as noted by the Missouri Botanical Gardens. 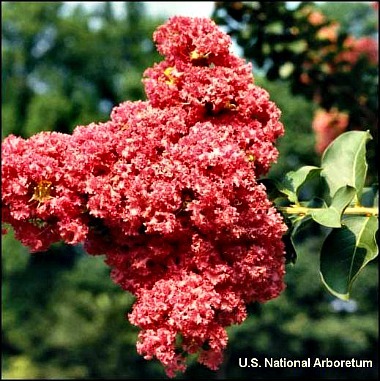 This hardy crape myrtle is a beautiful addition to butterfly gardens, the Tuscarora works in home landscapes, commercial landscapes and as street trees. One of the bloom images is from our Greenwood Nursery greenhouse (Thank you Michael!). For more images of the boom and Tuscarora bark visit the US National Arboretum page. Tuscarora is grown in a one gallon container. Plants shipping to CA and AZ addresses will be bare rooted before being prepped for shipping.